Biotechnology can deliver complex flavors both as fermentation products and single constituents. Recent developments in transgenic research have spawned numerous studies in the use of metabolic engineering of biosynthetic pathways to produce high-value secondary metabolites that can enhance the flavors of food products. Biotechnology is also playing an increasingly important role in the breeding of food crops for enhanced flavor. 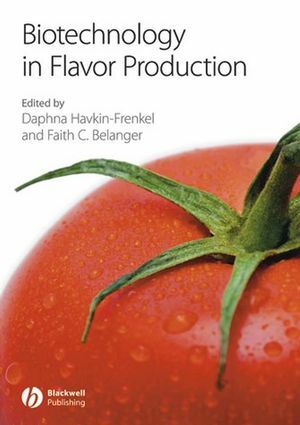 This book provides a unique overview of the current state of the art of flavor production through biotechnology, examining the principles and current methods of producing flavors from plants and other organisms. Chapters are included on plant tissue culture, genetic engineering of plants for flavor improvement and genetic engineering of bacteria and fungi for flavor improvement of fermented beverages and dairy products. The book is directed at food scientists and technologists in the food and flavour industries as well as academics and ingredients suppliers. 1. The development of yeast strains as tools to adjust the flavor of fermented beverages to market specifications (Jan H. Swiegers, Sofie M.G. Saerens and Professor Isak S. Pretorius, The Australian Wine Research Institute, Glen Osmond, Adelaide, Australia). 2. Biotechnology of flavor production in dairy products (Dr Bart C. Weimer, Sweta Rajan, Bala Ganesan, Center for Integrated BioSystems, Department of Nutrition and Food Sciences, Utah State University, Logan, Utah, USA). 3. Biotechnological production of vanillin (Dr Daphna Havkin-Frenkel and Dr Faith C. Belanger, The Biotechnology Center for Agriculture & the Environment, School of Environmental and Biological Science, Rutgers, The State University of New Jersey, New Brunswick, New Jersey, USA). 4. Plant cell culture as a source of valuable chemicals (Dr Chee-Kok Chin. Department of Plant Biology and Pathology, Rutgers University, New Brunswick, New Jersey, USA). 5. Tomato aroma: biochemistry and biotechnology (Rachel Davidovich-Rikanati and Yaniv Azulay, Institute of Plant Sciences, Newe Ya’ar Research Center, Agricultural Research Organization, Ramat Yishay, Israel; Yaron Sitrit. The Jacob Blaustein Institutes for Desert Research, Ben-Gurion University of the Negev, Beer-Sheva, Israel; and Yaakov Tadmor and Dr Efraim Lewinsohn. Institute of Plant Sciences, Newe Ya’ar Research Center, Agricultural Research Organization, Ramat Yishay, Israel). 6. Flavour development in rice (Louis M. T. Bradbury, Dr Robert J. Henry and Daniel L. E. Waters, Grain Foods CRC, Centre for Plant Conservation Genetics, Southern Cross University, Lismore, NSW 2480 Australia). 7. Breeding and biotechnology for flavor development in apple (Malus x domestica Borkh) (Dr Susan K. Brown, Department of Horticultural Sciences, Cornell University, Geneva, New York, USA). 8. Aroma as a factor in the breeding process of fresh herbs – the case of basil (Dr Nativ Dudai, Aromatic, Medicinal and Spice Crops Unit, ARO – Newe Ya`ar Research Center, Ramat Yishay, ISRAEL; and Dr Faith C. Belanger. Department of Plant Biology and Pathology and The Biotechnology Center for Agriculture & the Environment, School of Environmental and Biological Sciences, Rutgers, The State University of New Jersey, New Brunswick, New Jersey, USA). 9. Increasing the methional content in potato through biotechnology (Rong Di, The Biotechnology Center for Agriculture & the Environment, School of Environmental and Biological Science, Rutgers, The State University of New Jersey, New Brunswick, New Jersey, USA).